I know they're in trend, but I can't help but love an owl print. These lovely pieces come via painter, David Scheirer of Silver Spring, Maryland. He explains his process; "My illustrations are first drawn in pencil and then inked with waterproof India ink. 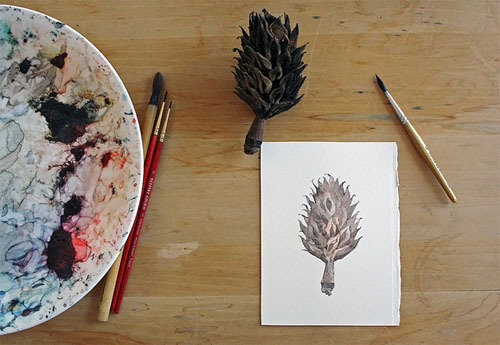 Then I build up layers of watercolor until I'm happy with the color." 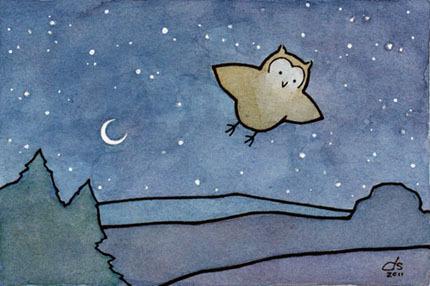 David adds, "The owl illustrations are unique from my other illustrations in that they sometimes give me a lot of trouble. I have redrawn most of them at least once and they often end up quite different from the original plan. The process feels much more organic that how I usually work." David likes to bird watch and made it his mission to find an owl in the wild. As he explains, "After several years and much wondering if I'd ever see one, I finally found a Great Horned Owl (above) and two owlets living in some large white pines. I went back almost every day for several weeks to see them. The Owl in Snow illustration is pretty closely based on these owls." See more of David's work from his Etsy site and Flickr page. Such wonderful work...thanks for sharing David.